The Firewire interface has not penetrated into computers as standard yet. 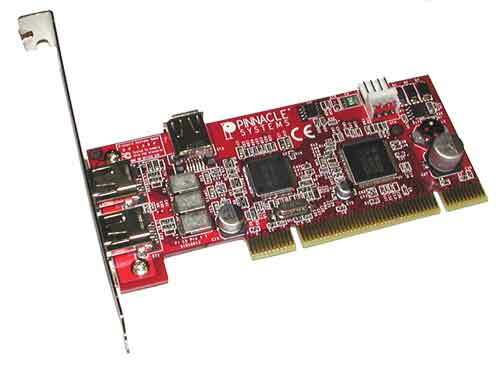 Therefore, the devices for video processing are connected through additional cards with Firewire interface. Just one such card is part of tested package. Why digital video? Data can be stored and recorded into and from the computer. For example, you do not have to store your film materials on a video tape immediately, but you can wait till more materials are collected, then you can arrange and edit the video and after that store it on the tape. When you have a digital camcorder, you can shoot anything and you do not have to worry that the film can spoil your work in the end. Parts which you do not like can be easily cut or skipped when recording. Data can be stored on a CD which is not too prone to mechanical damage as the VHS tape. 120 MB of disk space for every 20 minutes of video captured at preview quality (4 GB for every 20 minutes of finished movie). The Pinnacle Studio program has been designed for editing and processing video on a semi-professional level and is supplied together with the card. On the installation CD, there is version 7.01.3. Advancing development brings new updates, improvements and solutions of some problems. This update you can download from the Internet. At first start of the program, the automatic Internet connection and getting update files are offered. On 11th February 2002 the current version was represented by version 7.07.1. The update brings support of further devices (camcorders and web cameras) and solutions of some possible problems (more information you can find on pinnaclesys.com ). This update pack has 9,76MB. Stunning scene transitions - Program provides various effects for particular shots. For example 3D effects as "reverse screen" or "broken glass" and many others that give your film new dimension. Effects for slowing up or speeding up the record. Correction for light, color and contrast. TitleDeko™ - a file containing more than 300 styles of subtitles with possibility of changing font and creating new styles. SmartSound™ - creating sound effects, adding your favorite music as a background to your film. Other formats (e. g. Divx) are possible to be used after installing SW support. The rules are simple. By changing settings you affect the output quality and the total size of the video. In case you want to place your video on Internet, you have set up low size and limit quality. Choose the highest quality for putting the film back to tape (DV), but then you have to take the requirements of 14GB for 1 hour record into account.